So in the interest of science, I have done a little research. Summer skiing. Very safe unless you trip over each other. It seems that Summer Skiing is considered to be a safe sport. It is highly unlikely that you will fly home from your Skiing trip complete with a plaster cast. Whereas in winter skiing, a plaster cast is considered by many drinking companions, to be adequate proof that you actually did go winter skiing in the Alps. Skiing in wellies is perfectly acceptable. The cost of the clothing is also quite reasonable. You do not have to spend the kids inheritance on fashionable ski attire. It is quiet acceptable to go summer skiing in wellies, jeans and a silly hat. Learners on a nursery slope. But with all sports, it is very important to find the best summer ski instructor. Here you can see three beginners getting to grips with this demanding sport. These are not English Summer Skiers, because there is not a knotted hanky or beer belly in sight. 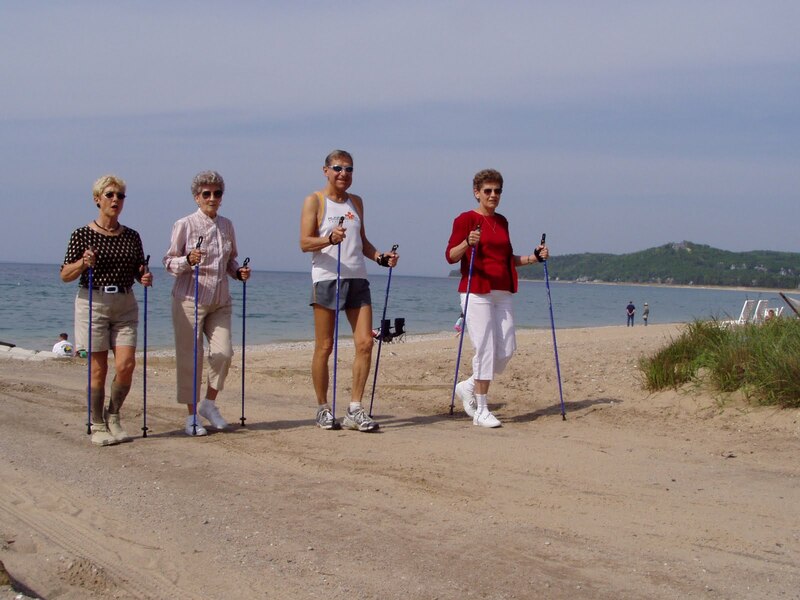 Although I do not condone summer skiing on a beach, in my opinion beaches are for relaxing, and sunbathing, not running around waving dangerous ski poles. It is advisable to check with your local authorities for restrictions. Your own garden is a very good place to practise Summer Skiing. 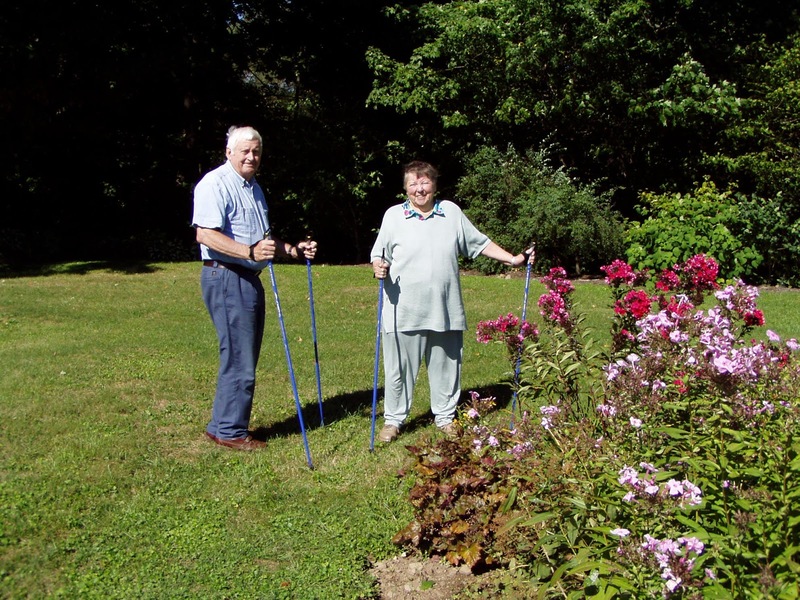 After all, if you are worried about falling down and getting tangled up with your ski poles, it is better to do so in your own garden, rather than out on the road where someone might have a handy camera. Summer Skiing is also an indoor sport. For those rainy days, and here I am thinking of the people who still live in England, Summer Skiing can take place in the comfort of your own home. A word of warning, cornering around the coffee table should only be undertaken by experienced Summer Skiers. And please mind the dog. No special footwear is necessary. So to recap. 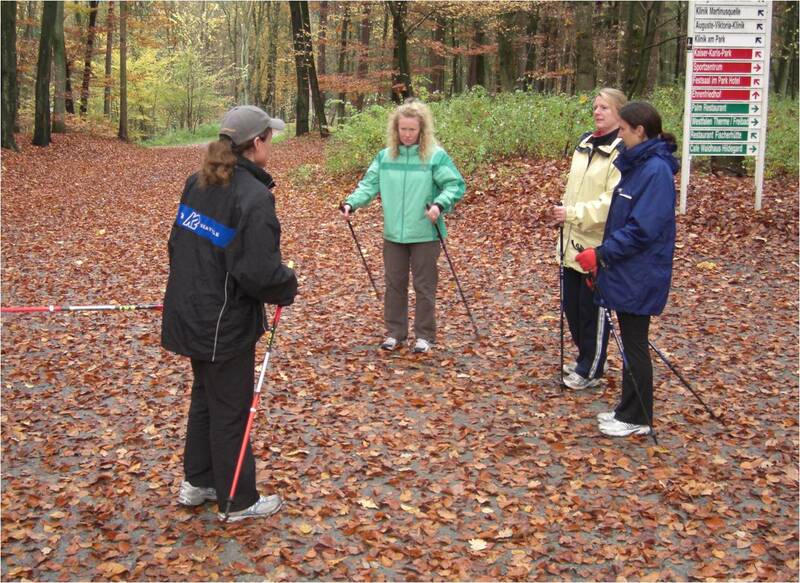 Apart from the cost of two sticks ski poles, the cost of this sport is very low. No ski lift passes, no expensive medical bills and you don’t have to freeze to death. ← A mother in law, a pen knife and the airport police. The whole concept of not freezing to death works for me. I am not sure, but summer skiing is taking off near me. It’s incredible how evolution works. We managed to get from using four limbs for transport to two. 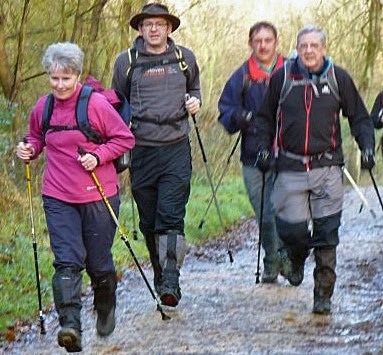 However, it’s only in the last few decades that people have realised the absolute necessity of poles for walking. It stops the arms dragging along the floor, aparently. I have quite wide feet, so I very much want a pair of those shoes in the last photo. I could cover all three car pedals at once, leaving my other leg to relax and have a day off! Lol, I will try and find you some of the shoes. I don’t want to get into a discussion on sport bras.. but the old dears, in their spandex pants and t shirts caused quiet a stir. They were old enough to be my granny. where can you buy those sticks Pecora Nera? Age Concern? Is it good price 2-4-1? Poor Gilda, She only barks to say hello, oh! and don’t move or I might bite you. Definitely one of the spring in Moscow highlights is watching old people do this. By their faces, I’m sure it’s a very intense sport. The two old dears were almost running. I had never seen it before. In the countryside in Italy people do walk with sticks, but they are really carried to ward off dogs. Mr Hoff does look pretty cool with the old dears doesn’t he. Be honest, is that you? I am short, fat, bow legged, my knuckles drag on the floor. I walk with a slight lisp. But apart from that I am stunningly handsome. I couldn’t manage a pair of ski poles. I have enough trouble trying to organise my dyslexic legs. I am surprised at the fitness of the old biddies in Italy. But they keep fit by cycling and constantly digging in their garden to grow vegetables. The difficulty is Gilda, although she is as fat as a little pig, she is extremely happy. Whilst the Italian Summer Skiers appear to be in a lot of pain and distress. Aching joints etc. My worry is, I spend 6 months losing weight and turning my body into something that resembles a God, only to be run over by some Italian twerp in a car. Fair point! I think if I was living in Italia I wouldn’t be able to resist all the lovely nibbles and tipples and would also rather be fat and happy! How could you live in Italy and not eat??? I have just returned from an unexpected lunch invitation. Carne crudo followed by tagliatelle con salsicca washed down with a very fine bottle of Barbera. An espresso and a little snifter of grappa. I’m looking for matching outfits for J and I now. Alps here we come! On another note – we’re in Florence this weekend. PN! Why did you not stress how urgent it was to get to this country! 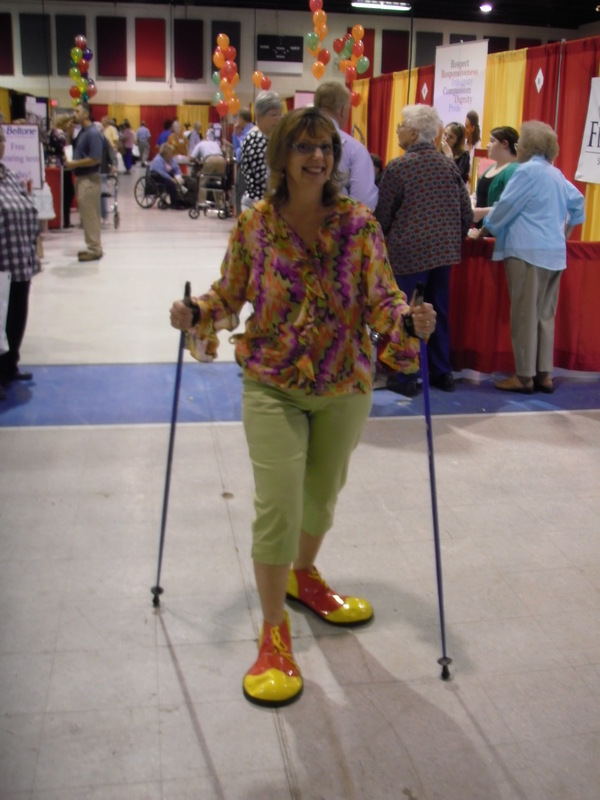 I’m head over heels..
Those walking sticks are great- they double up as cattle prods and BBQ prongs. I think they get used as Gilda prods. In a day and age where we think we’re eating beef but we’re actually eating horse, I’m sure we’d think Gilda was chicken if it was printed on the label. You have a valid point. But if we turn Gilda into hot dogs, what will I be able to write about??? Do I need to return early to save my beloved Gilda from the dinner table?! By the way, Happy Birthday Donna. 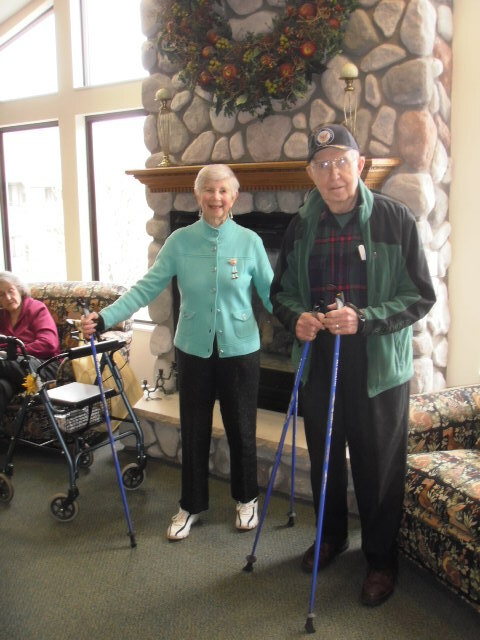 Ski poles are a good cover up for needing a walking cane. Hello, I’ve nominated you for the Versatile Blogger Award (http://versatilebloggeraward.wordpress.com/vba-rules/). Congratulations! Hilarious! The Germans love summer skiing but they are geeks so that’s no surprise. I thought the Italians had more style? First I am so pleased you thought it was funny. The Italians have loads of style, but I am not sure if this sport will catch on in Italy because there is no way they can carry their Versace handbags and use their mobiles whilst Summer skiing. haha, no then I think not! Of course the Germans get around this by wearing bumbags or rucksacks (hands-free!) and not owning a mobile phone. That should go nicely with the poles. Maybe the bumbag version is cheaper.